In a rousing speech before Congress on May 24, Israeli Prime Minister Benjamin Netanyahu rejected peace talks with the newly unified Palestinian government because it now includes — on paper at least — officials from the terrorist (or, in its own eyes, “resistance”) group Hamas. In a striking moment, Netanyahu defiantly declared, “Israel will not negotiate with a Palestinian government backed by the Palestinian version of al Qaeda,” a statement greeted with resounding applause from the assembled members of Congress. But hold on a minute. Yes, Hamas, like al Qaeda, is an Islamist group that uses terrorism as a strategic tool to achieve political aims. Yes, Hamas, like al Qaeda, rejects Israel and has opposed the peace talks that moderate Palestinians have tried to move forward. And sure, the Hamas charter uses language that parallels the worst anti-Semitism of al Qaeda, enjoining believers to fight Jews wherever they may be found and accusing Jews of numerous conspiracies against Muslims, ranging from the drug trade to creating “sabotage” groups like, apparently, violent versions of Rotary and Lions clubs. But the differences between Hamas and al Qaeda often outweigh the similarities. And ignoring these differences underestimates Hamas’s power and influence — and risks missing opportunities to push Hamas into accepting a peace deal. While Congress was quick to applaud Bibi’s fiery analogy, U.S. counterterrorism officials know that one of the biggest differences is that Hamas has a regional focus, while al Qaeda’s is global. Hamas bears no love for the United States, but it has not deliberately targeted Americans. Al Qaeda, of course, sees the United States as its primary enemy, and it doesn’t stop there. European countries, supposed enemies of Islam such as Russia and India, and Arab regimes of all stripes are on their hit list. Other components of the “Salafi-jihadist” movement (of which al Qaeda is a part) focus operations on killing Shiite Muslims, whom they view as apostates. Hamas, in contrast, does not call for the overthrow of Arab regimes and works with Shiite Iran and the Alawite-dominated secular regime in Damascus, pragmatically preferring weapons, money, and assistance in training to ideological consistency. Hamas, like its parent organization, the Muslim Brotherhood, also devotes much of its attention to education, health care, and social services. Like it or not, by caring for the poor and teaching the next generation of Muslims about its view of the world, Hamas is fundamentally reshaping Palestinian society. Thus, many Palestinians who do not share Hamas’s worldview nonetheless respect it; in part because the Palestinian moderates so beloved of the West have often failed to deliver on basic government functions. The old Arab nationalist visions of the 1950s and 1960s that animated the moderate Palestinian leader Mahmood Abbas and his mentor Yasir Arafat have less appeal to Palestinians today. One of the greatest differences today, as the Arab spring raises the hope that democracy will take seed across the Middle East, is that Hamas accepts elections (and, in fact, took power in Gaza in part because of them) while al Qaeda vehemently rejects them. For Ayman al-Zawahiri, Osama bin Ladin’s deputy and presumed heir-apparent, elections put man’s (and, even worse, woman’s) wishes above God’s. A democratic government could allow the sale of alcohol, cooperate militarily with the United States, permit women to dress immodestly, or a condone a host of other practices that extremists see as forbidden under Islam. So yes, Hamas, like al Qaeda, talks of an Islamic government, but in practice it makes compromises, as its unity agreement with Abbas and his regime suggests. In power, Hamas has tried to Islamicize Gaza, and its rule in Gaza is notable for its repression, but it has not imposed a draconian regime as did the Taliban in Afghanistan, the only government al Qaeda ever recognized as truly Islamic. In the end, Hamas is pragmatic. It makes compromises with rivals, cuts deals with potentially hostile foreign sponsors, and otherwise tries to strengthen its political position, even if this exposes it to the charge of hypocrisy. Nowhere is this more apparent that in Hamas’s relations with Israel. Especially since the 2008-2009 Cast Lead Operation, where Israeli forces hit Gaza hard, Hamas has often (though not always) adhered to a ceasefire with Israel. In the months following Cast Lead, only a few rockets were launched at Israel from Gaza, and Israeli officials told me those were probably from other Palestinian groups or were otherwise not an official Hamas action. Gazans did not want to go another round with Israel’s army, and Hamas feared alienating them. Yet Hamas tries to maintain its street cred as a resistance organization. It has at times allowed other groups to launch attacks on Israel, and in recent months launched missile salvos itself, risking an end to the de facto ceasefire. Internal pressures within Gaza, particularly criticisms from Salafi-jihadists with ideologies akin to al Qaeda, as well as Israeli attacks on Hamas personnel, have at times led the group to risk further retaliation, but this careful calculation is a far cry from al Qaeda’s call for constant struggle. Hamas needs no reminder that al Qaeda is more foe than friend. Though Ismail Haniyeh, Hamas’s leader in Gaza, praised bin Ladin after his death as an “Arab holy warrior,” this was largely pandering to his religious base. In fact, the relationship between Hamas and al Qaeda, and between Hamas and al Qaeda-like jihadists in Gaza, is far more contentious. Zawahiri has blasted Hamas for adhering to ceasefires with Israel, not immediately implementing Islamic law in Gaza, and otherwise deviating from the pure faith of jihadism. To prevent these ideas from eroding its support, Hamas has harshly repressed al Qaeda-inspired jihadists in Gaza, arresting and even torturing some of the individuals linked to these groups, according to Israeli sources. In 2009, one Salafi-jihadist preacher declared Gaza to be an Islamic state; Hamas stormed the mosque that was his base, killing him and over 20 others. But the biggest difference is that Hamas is a success while al Qaeda is a failure. Hamas has gone from a small group overshadowed by Yasir Arafat’s Fatah to a large and powerful organization. Whether we like it or not, Hamas is the government of Gaza — and terrorism helped them get there. And with the fall of Mubarak and the emergence of the Muslim Brotherhood in Egypt as an important political actor there, Hamas may gain influence. Al Qaeda, in contrast, is if anything farther from its goals of ending U.S. regional influence and establishing a caliphate than it was 15 years ago. Despite Netanyahu’s rhetoric, Hamas cannot simply be wished away when it comes to the peace process. It represents a large portion of Palestinian opinion, and it has repeatedly demonstrated that it can use suicide bombers, rocket attacks, or other forms of terrorism to disrupt any talks. But the group’s occasional pragmatism suggests that under the right conditions it can be convinced not to play the spoiler. Such an effort may fail and involves many sticks as well as carrots, but a similar effort with al Qaeda would be a fool’s errand. Netanyahu’s government may be dead-set against talking with Hamas, but treating it like al Qaeda and using this as a reason to not negotiate with moderates like Abbas only convinces skeptical Palestinians that negotiations will never work. Indeed, the failure to restart peace talks only makes Hamas stronger, making a difficult task impossible in the years to come. I am neither a professor nor a foreign policy “expert”. I am however a Jew that views Israel as the home of the Jewish people. Your piece on “Calling Hamas the al Qaeda of Palestine isn’t just wrong, it’s stupid” is a thought provoking look into the relationship between Israel and Hamas and honestly, I did enjoy it. However the problem I have is that you, like so many academics, tend to allow the very basics of right & wrong, good & evil, to become clouded in your own minds. In an effort to dissect the politics, you miss the obvious; Al Queda, Hamas, Muslim Brotherhood, Fatah, Hezbollah…the list goes on…they are all of one mind when it comes to Israel and Jews – “Wipe Israel off of the map & slaughter them all, wherever they may be”. This only because of pure evil and pure hatred. No amount of legitimization on the part of the politics will wipe away the innocent blood of thousands of Jews from the hands of Hamas (or any other Islamic terrorist group). You speak of Hamas as if they are a coordinated, calculating, and structured political organization. They are terrorists Dr. Byman. They murder innocent people, blow them up, stab children and families in their sleep (Fogel family – no not “claimed by Hamas”, but no doubt the perpetrators were inspired by the murderous philosophy of Hamas), kidnap soldiers, and behead their own people in the middle of the street. Do you really think their ideals are so domesticated? There is scarce evidence that I see for anything that can be remotely called an “Arab Moderate”. 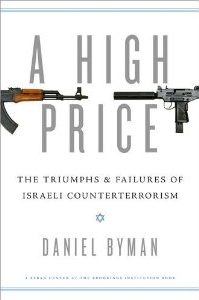 I fully support Netanyahu’s comments and I urge you & other academics to see the truth for what it is. The other alternative, which I think best, is for you to accompany the IDF on their missions to see what they are really up against on a daily basis. On June 7, 1967 for the first time in 2000 years, Jewish people took control of their holy city of Jerusalem after coming under attack by Arab nations from all sides. This Six Day War in ’67 resulted in the reunification of Jerusalem and saw Israeli paratroopers enter the Temple Mount and defeat the Jordanian forces trying to hold off the Israeli soldiers. Jordanian soldiers asked the Jews if they were going to build their Temple on the Temple Mount where two previous Jewish temples had stood. Ironically, Israeli leaders believed they could acquire peace by appeasing the Muslims and returning control to the Islamic Trust for the Temple Mount. This arrangement has not worked out for 44 years and the situation on the Temple Mount is very explosive and could break into an armed conflict very quickly. In fact, that scenario is what will happen according to the ancient Jewish prophet Zechariah, who said that Jerusalem will become intoxicating to those who are non Jews controlling the Temple Mount and the entire city of Jerusalem, Zechariah 12:2. Zechariah also said that the Lord is aggressively possessive for Jerusalem, He is very sorely displeased with those who are arrogantly secure with their control of the Temple Mount and that the Messiah, Jesus Christ will one day come back to Jerusalem to build His Temple on that sacred piece of real estate and to dwell among the Jewish people there forever, Zechariah 1:14-16 and Psalm 132:12-13. OK, so al quida is a smaller version of a poisonous snake, but the one who is bitten still dies and the one who issues foolish warnings saying the small snake is innocuous is in the end complicit in causing harm to inocents. That is you professor, youu are a wicked messenger. The only thing worse than an idiot, is an idiot with a Phd. You absolutely failed to prove your point.